Years ago, when I first tasted this lovely combo of Cabbage and Bengal Gram Dal/Chana Dal/Split Chickpeas from our school canteen, I was totally fascinated with it. This was a new Upperi (side dish) for me. It was never made by my mom. 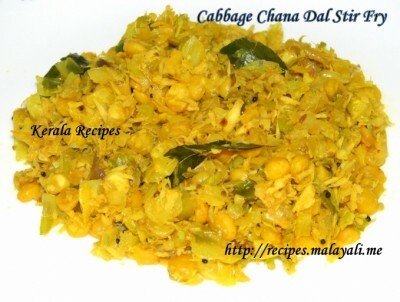 Years later, here I am with the recipe for making a wonderful Side Dish with Cabbage and Bengal Gram Dal (Kadala Parippu). This Cabbage Kadala Parippu Upperi reminds me of the good old school days when I used to have lunch at the school Canteen with my friend Devi. Soak Chana dal for around 2 hours. Pressure cook chana dal with salt and a pinch of turmeric on medium heat for around 2-3 whistles. The dal should not get overcooked. It should retain it’s shape and yet be soft. Once cooled, drain the cooked chana dal and keep aside. Add finely diced onions and saute until translucent. Add curry leaves, green chillies, ginger and garlic to the pan. Saute for a few minutes. Reduce heat and add turmeric powder, cumin powder and red chilly powder. Add the chopped cabbage along with salt and mix everything well. Cover and cook on medium low heat for 8-10 minutes stirring occasionally. Remove lid, and add the cooked chana dal. Mix well and cook for another 5 minutes till all water has evaporated and the cabbage is completely dry.